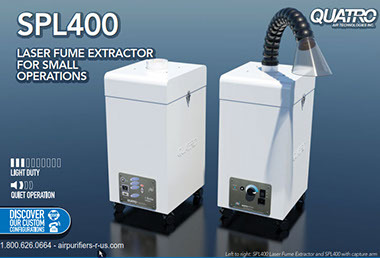 We are your source for genuine Quatro Air fume extractor / air filtration systems replacement filters: HEPA filter, pre-filters, dust bag filter, bulk loose activated carbon and spare parts: motor, fuses, motor parts, etc. We also can help you with accessories to help you get the most out of your air filtration system investment. Most orders ship out within a couple of days of receipt of order. Most items are stocked items.